£29.99 £24.99 as of 25-04-2019 11:49:49am GMT (product prices and availability are accurate as of the date/time indicated and are subject to change. Any price and availability information displayed on the supplier's website at the time of purchase will apply to the purchase of this product). Our number one best seller and it’s easy to see why – this delightful topiary ball with rich purple flowers is really dense, without any gaps, for a beautiful display outside your home or office. It measures 38cm across and the attached triple galvanised hanging chain also measures 38cm. The purple rose topiary ball can be hung up outside long term without worry – or you can bring it in during very bad weather to avoid the possibility of damage and prolong its lifespan. It is very hard wearing but looks incredibly detailed and really does catch the eye. Artificial topiary balls like this one are a superb alternative to the traditional hanging basket. Unlike hanging baskets, they are entirely maintenance free, requiring no weeding, trimming, feeding or watering. They provide a wonderful, colourful year round display without the need to replace plants and they won’t wilt, bend or break in the hot sun or strong wind. They add both colour and class to an entrance door and look super whether you choose to hang just one or whether you buy two, one for each side. It’s very easy to see why these are called ‘the new hanging basket’ – they do everything a hanging basket does without any of the hassle and with a much neater effect! 38cm artificial purple rose topiary ball	Overall rating:	4.6	out of 5 based on 11	reviews. Stunning artificial hand made ivory/cream bride's rose bouquet £29.75 as of 25-04-2019 11:49:49am GMT (product prices and availability are accurate as of the date/time indicated and are subject to change. Any price and availability information displayed on the supplier's website at the time of purchase will apply to the purchase of this product). 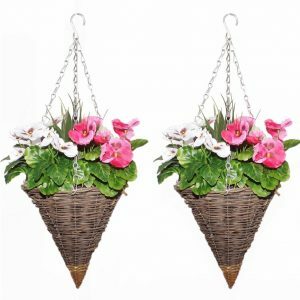 Pair of artificial cone shaped hanging baskets with pink and white flowers £45.95 as of 25-04-2019 11:49:49am GMT (product prices and availability are accurate as of the date/time indicated and are subject to change. Any price and availability information displayed on the supplier's website at the time of purchase will apply to the purchase of this product). Artificial hanging basket with azaleas, geraniums, vines and ivy £69.99 as of 25-04-2019 11:49:49am GMT (product prices and availability are accurate as of the date/time indicated and are subject to change. Any price and availability information displayed on the supplier's website at the time of purchase will apply to the purchase of this product). 30cm Holly Topiary Ball £34.99 £15.99 as of 25-04-2019 11:49:49am GMT (product prices and availability are accurate as of the date/time indicated and are subject to change. Any price and availability information displayed on the supplier's website at the time of purchase will apply to the purchase of this product). Artificial blue lavender topiary ball (40cm) £34.99 £26.99 as of 25-04-2019 11:49:49am GMT (product prices and availability are accurate as of the date/time indicated and are subject to change. Any price and availability information displayed on the supplier's website at the time of purchase will apply to the purchase of this product). 30cm artificial purple flower hanging topiary ball £18.99 as of 25-04-2019 11:49:49am GMT (product prices and availability are accurate as of the date/time indicated and are subject to change. Any price and availability information displayed on the supplier's website at the time of purchase will apply to the purchase of this product).